When a co-worker complains about a case of the Mondays or sighs TGIF at the end of the week, they’re not alone. According to a recent Gallup poll, 71% of Americans consider themselves disengaged at work. This represents an opportunity for employees and HR managers to think about how to build satisfaction (and its byproduct, happiness) in the office. The sweet spot for employee engagement lies somewhere in the balance between boredom and overwhelm. What gets in the way? Many people find themselves stuck on one side due to clutter of meeting-packed work days. Their challenge becomes finding time to focus on the important things, like the work they came to do in the first place. Setting aside the obvious reasons like salary and benefits for a moment, many people come to work each day to exercise their respective intellects. Five year olds don’t aspire to be middle managers when they grow up; they want to design, explore, or build. They want to save the world. The best parts of a work day happen when these ideals are within reach. These are the times when we find ourselves fully absorbed in an activity that is challenging, achievable, and purposeful. Turns out science has a name for this: the flow state. It happens when we’re so enthralled with solving a problem that distractions like phone calls or stomach rumblings disappear. We feel energized and accomplished. Work becomes fun. And its no secret that both engagement and productivity skyrocket when people have the opportunity to perform at their best. Unfortunately these focused stretches of time ‘in the zone’ are hard to come by. Interruptions cascade from email, office chatter, meetings, or a broken printer (again). Days fill up with menial tasks instead of meaningful work, causing the average office employee spends less than 5% of her day in a flow state. And that’s if they’re able to get there at all. Our team spends a lot of time thinking about ways to reduce work day clutter to allow for more productivity and fun in the office. Here are three tools we’re using to increase the chances of flow at work. Ever notice that meetings never seem to end early? Research shows that tasks take the time allotted for them (science has a name for this too, Parkinson’s Law). Calendar apps typically block 30 minutes by default, but we’ve learned that manually shaving time from the onset sets expectations for a quick, focused meeting. 20 minutes keep folks on point, resulting in time for everyone to get back to their desks and get a jump on the action items. If you want to spend less time in meetings, start by scheduling them for shorter time slots (even if you think you’ll go over). Being available all the time has an adverse affect on productivity and brain power. Performance decreases by 20% with frequent interruptions, and people typically need 25 minutes to return focus toward the initial task. When office workers have an average of just 11 minutes between distraction, it’s a real miracle actual work gets done. At Robin, our office is an open floor plan which lends itself to both collaboration and chaos. Blocking off an hour or so each day for challenging and skill dependent work means more than just adding an item to a to-do list. We’ve found the easiest way to get to the flow state (and rock your work day) is by removing distractions where possible. Instead of headphones, try finding a quiet, secluded place within the office to work anonymously for an hour. Let others know you’re busy to set expectations and mitigate interruptions from email, phone, or chat. Then, get in the zone. We’ve all wasted countless minutes wandering the halls in search of an open meeting room, or delayed meeting start times for the colleague who didn’t arrive on time. Frustrating, right? These brief moments of anxiety, or micro-stresses, add up throughout the day. They take energy from meaningful decisions and the ability to create impactful work. Some people reduce these moments by wearing the same thing every day or by following a rigid schedule. We’ve found that making sure our shared calendars stay updated helps reduce an enormous amount of clutter in the day. Not only does it helps build respect for each other’s availability, real-time updates help teams make better decisions when it comes to collaboration and finding space to work. 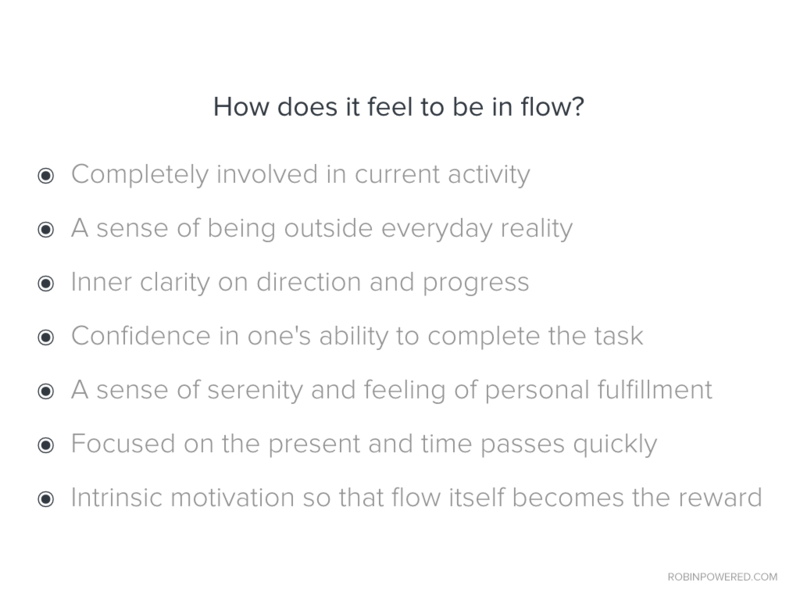 How do you find your flow at work? Share with @robinpowered.